Experts say fish is one of the healthiest foods we can eat, and when it’s this tasty, even better! Make the King Kullen seafood department part of every shopping trip and bring home the goodness of the sea. Shrimp (we clean them and cook them at no extra charge), lobsters, clams, cod, mussels, scallops, flounder, swordfish, if you name it we’ve got it! Delivered fresh daily and caught locally whenever possible. Don’t forget about our large selection of seafood platters and catered dishes! We now also food delivery for our seafood department along with all your other groceries. Learn more here. These lobsters come from Maine or Canada and are delivered daily upon request. They are then kept alive in our tanks. Lobster sizes vary from 1 ¼ pounds to as large as 3 pounds. Larger sizes are available upon request. 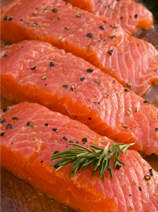 We carry a large variety of fresh cut and previously frozen fillets. Our associates will be happy to help you with cooking ideas and recipes. We offer a complete variety of sizes of Farm Raised Shrimp. Our buyers purchase these shrimp only from waters and farms that will give our customers the firm and tasty shrimp they deserve. Ready to be served as appetizers or hors d’oeuvres before the main course. These shrimp come in various sizes from cocktail size (71-90 per pound) to colossal size (16 – 20 per pound). All our raw shrimp can be peeled and deveined while you shop at no extra charge. These are available in various sizes, from 31-40 per pound to 8-12 per pound. 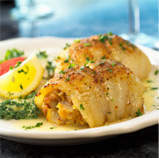 Our seafood associates can help you with the proper cooking times and sauces or breading to complement your selection. Available in 2 sizes. Our small platter has 2 lbs of 51/60 count cooked shrimp and our large platter has 3 lbs of 51/60 count cooked shrimp. Both are accompanied with cocktail sauce and lemon. Larger size shrimp available upon request at an additional cost. Come to us from environmentally safe water, they have a New York State Department of Agriculture point of origin tag when received. We will gladly open all shellfish free of charge. You can find a delicious variety of hot and cold soups such as Lobster Bisque, New England Clam Chowder, Manhattan Clam Chowder, Chicken Noodle, Minestrone, Chili and many more. King Kullen is proud to offer catering for all occasions. We prepare a variety of shrimp platters and salad platters for all needs and budgets. Fried Clam, Shrimp, Flounder and Tilapia dinners are available on request. 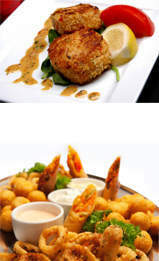 We also have a selection of crab cakes which are made on premises daily. All of these items are oven ready for your convenience.